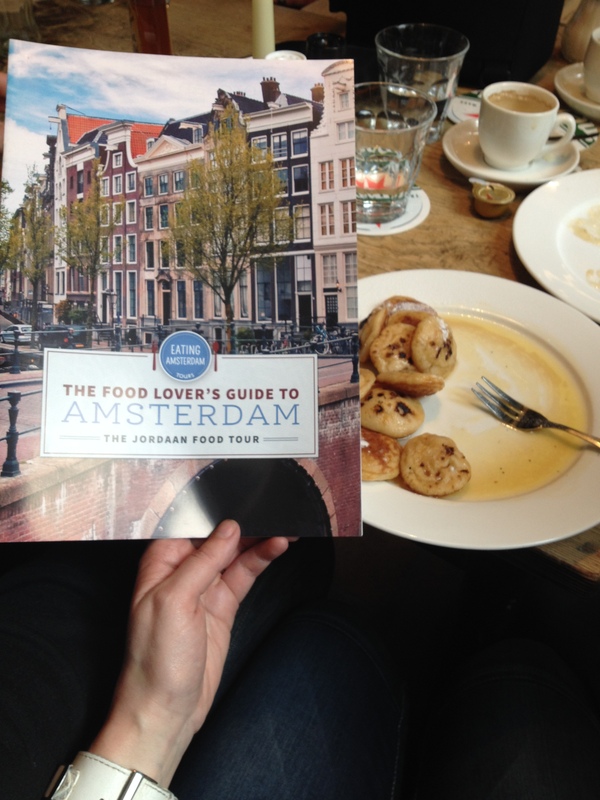 Last month, I was lucky enough to be invited along on an Eating Amsterdam Tour. They lured me with bitterballen, obviously. 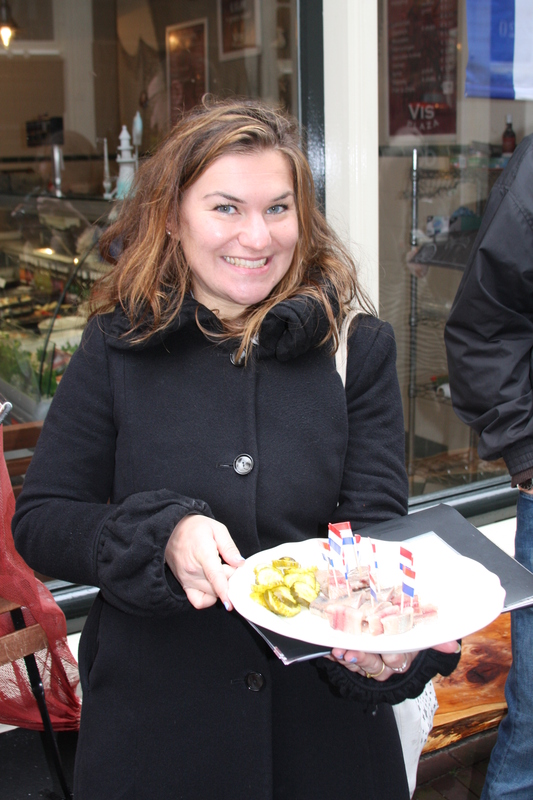 I’ve never done a food / tasting tour anywhere before, so it was an exciting first! 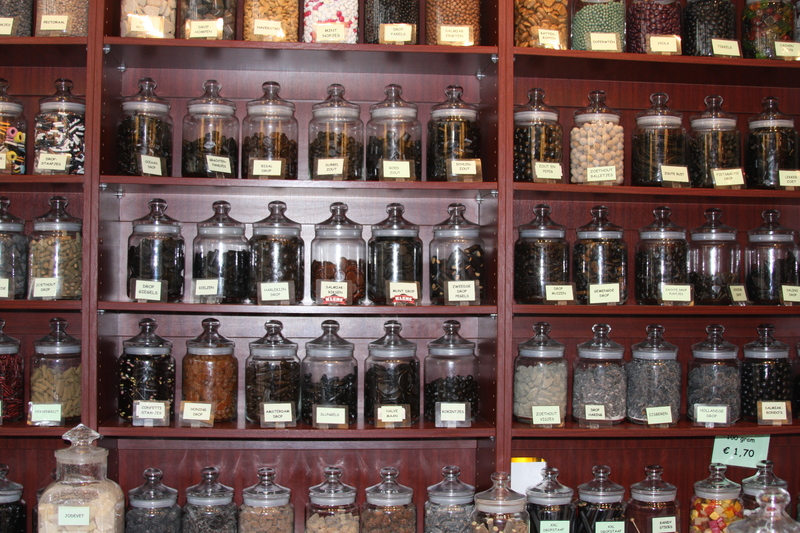 Before I start: A few days ago, one of my fellow expat bloggers posted about her experience of the same tour… and while I enjoyed her post, she went into huge amounts of detail about every aspect of the tour along with pictures of every single food they tried. I’m NOT going to do that. If I tell you everything that happens and everything you eat – there will be no surprises if you want to do the tour yourself! 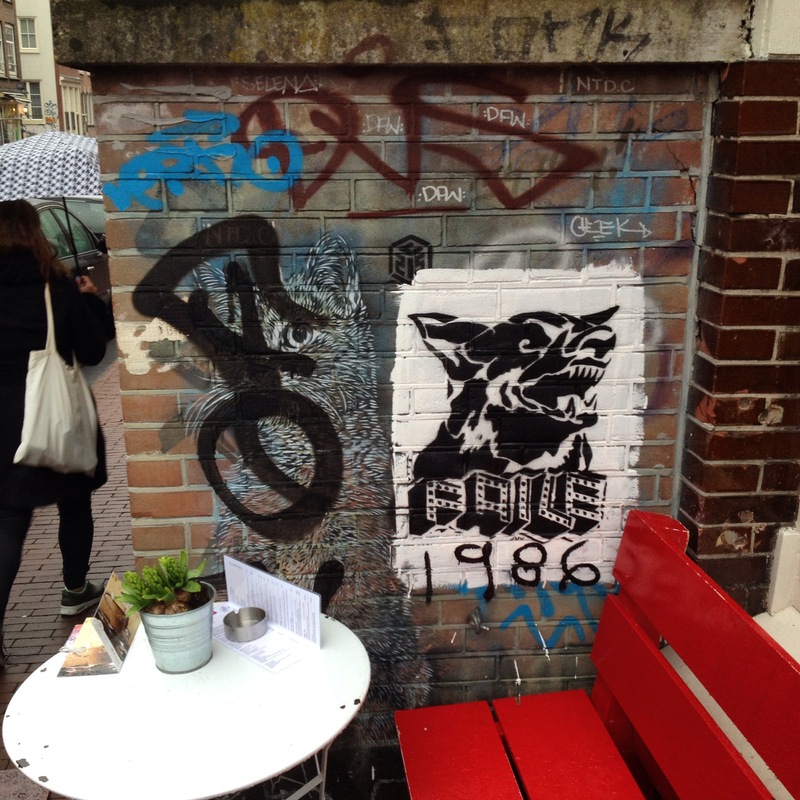 So, here in Bitterballenbruid fashion, is a higgledy piggledy series of events that may have happened on the Amsterdam food tour – in no particular order. SPOILER: There were bitterballen. Because I’ve already ruined that part: let’s start with it. 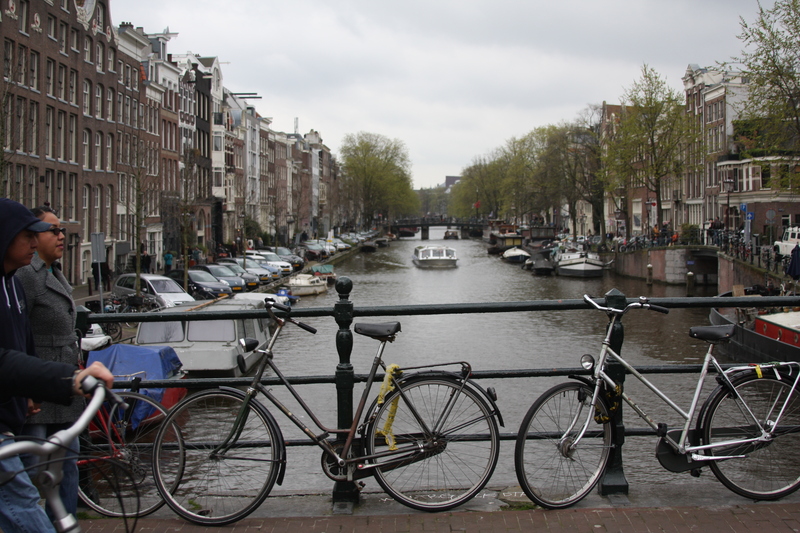 We went on the Jordaan Food & Canals Tour – so yep, you go on a canal boat! Woop woop! Definitely one of the highlights of the tour. 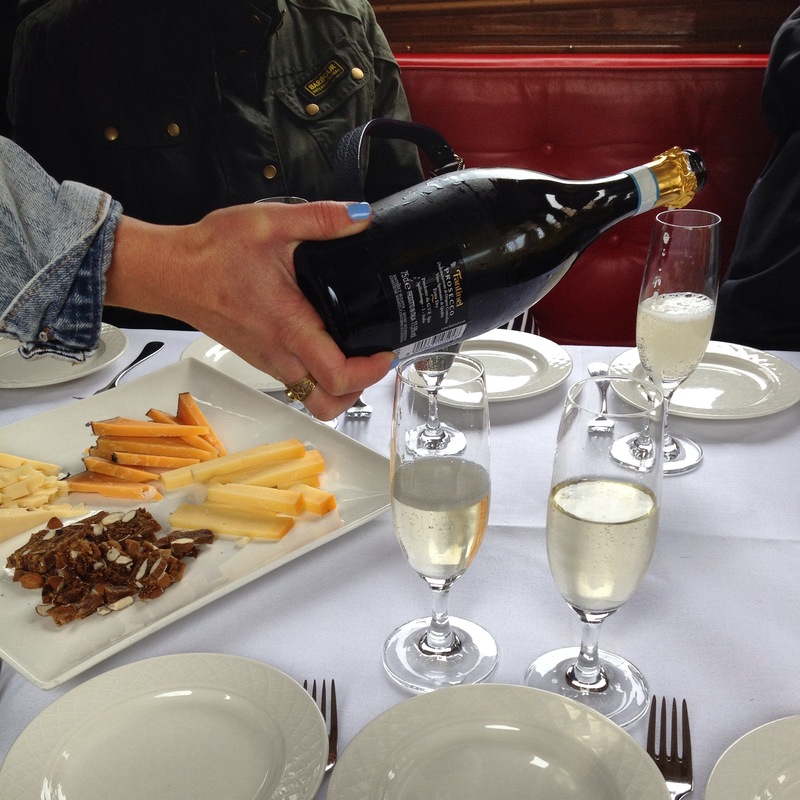 The captain is awesome, friendly and funny and you get to drink prosecco and eat cheese and bitterballen whilst cruising around the Amsterdam canals. Sweeeeeeeeeet! 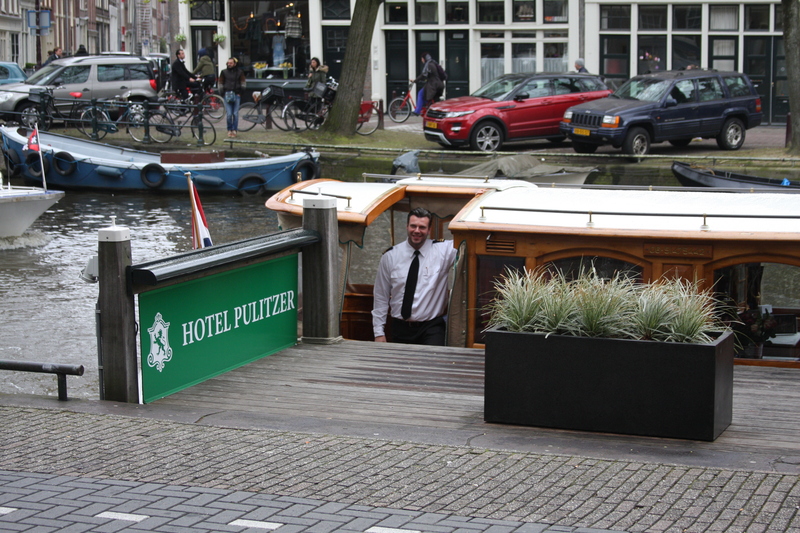 So yeah, you get on a boat and are greeted with this happy sight! 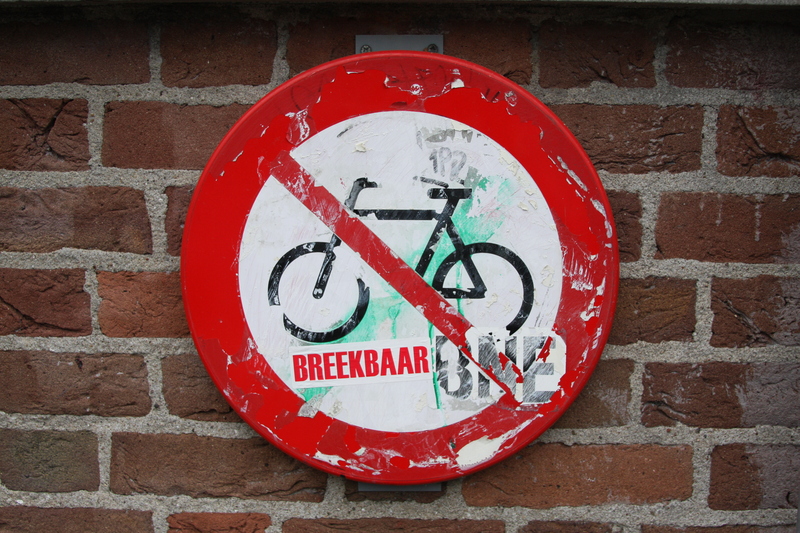 Only in Holland, right? 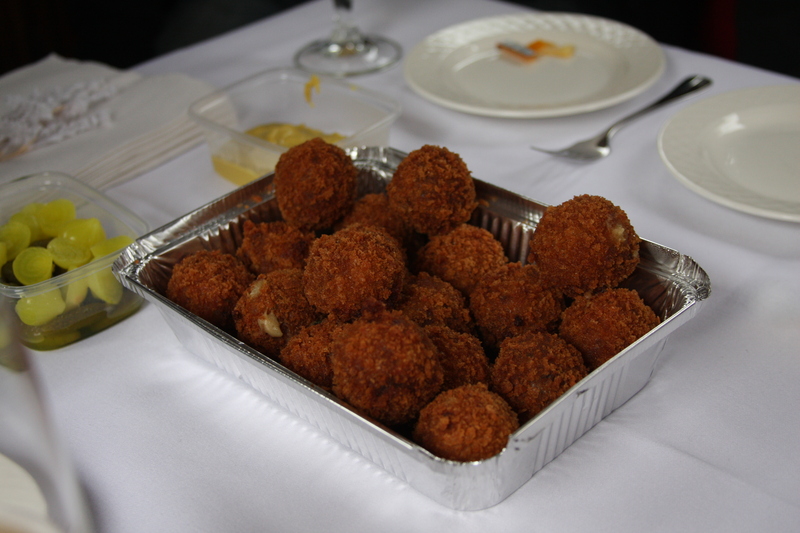 BITTERBALLEN DELIVERY! They get one of the best scores yet… a 9/10. Bravo Holtkamp bakery! Absolutely delicious! They’re definitely in my top two ever (the others were at the SkyLounge) but I always score including presentation, so they have to get a minus point for that. Foil tray indeed! 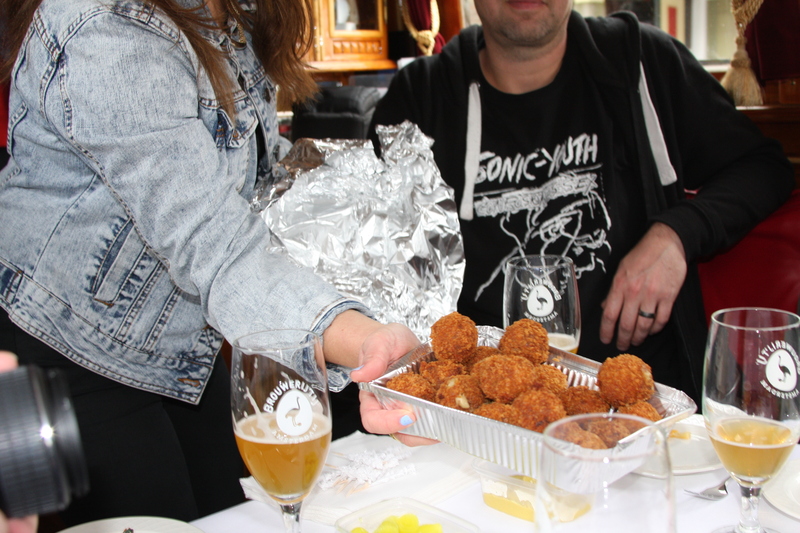 And you clearly can’t have bitterballen without yet more alcohol! YAY! Hungry yet? 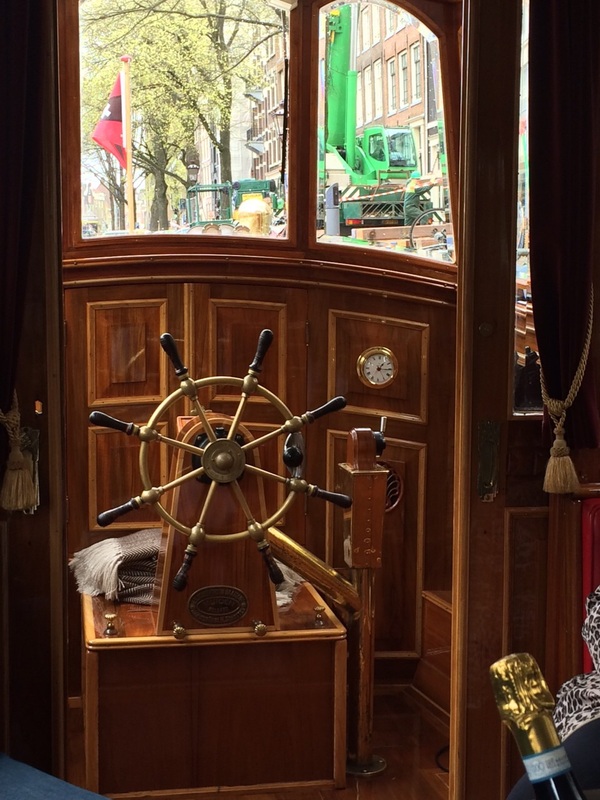 So, boat tour over – let’s go to my least favourite part… LIQUORICE! 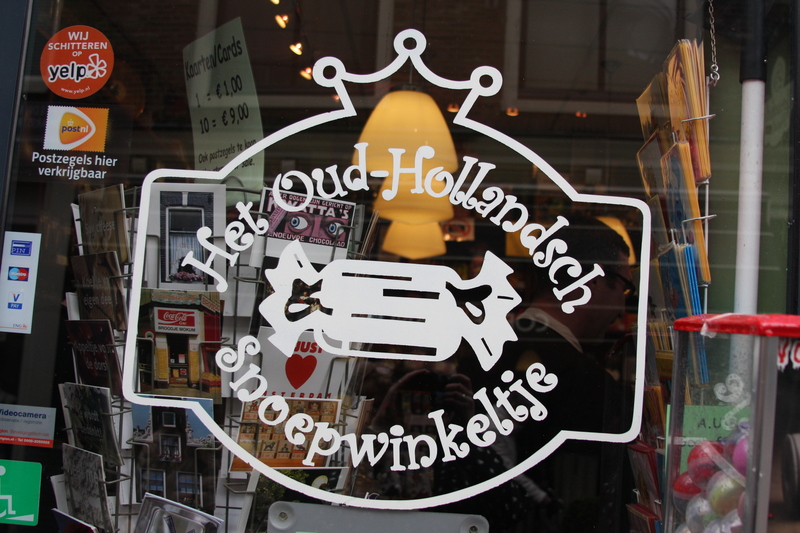 Het Oud-Hollandsch Snoepwinkeltje is owned by Mariska, who is very Dutch (I mean, very direct). I was a bit scared of her, especially when she told an American lady off for taking photos and not listening… but I’m a blogger, so I’m allowed to take photos? Right? Pleeeeeeease? I hate drop… and (sadly) nothing changed. I tried it. I still hate it. The Dutchie tried it. He still loves it. We got a bag each to take away, so he was super happy as he got two bags! 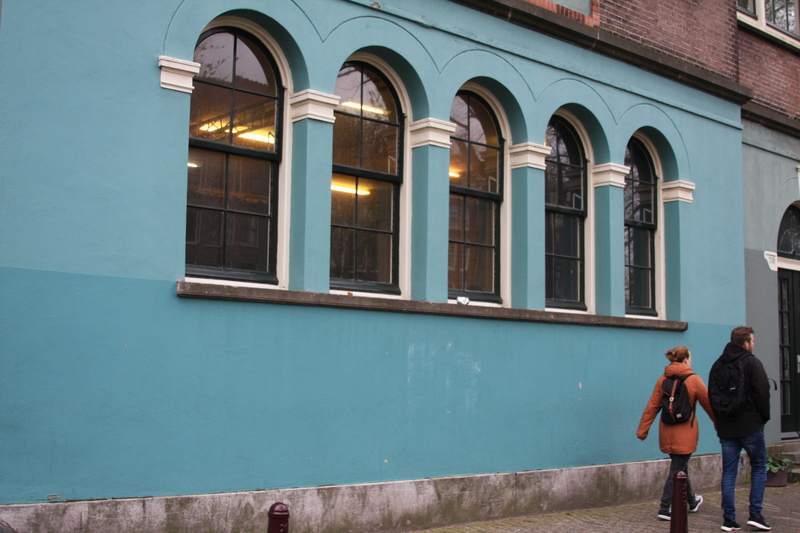 As you can see, it was a pretty dreary day in Amsterdam – but our tour leader Annamaria kept our spirits up! 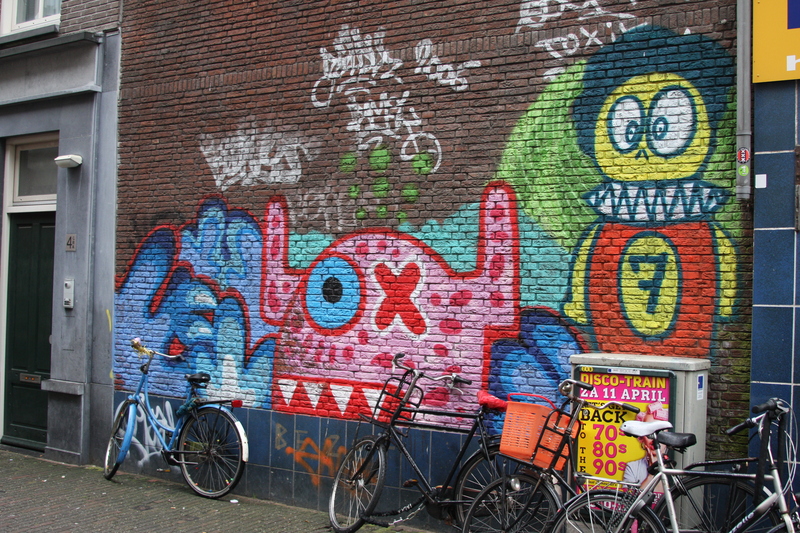 In addition to all the delicious food, I also used the walking part of the tour to get some random Amsterdam shots… and of course, I had to stop every time I saw any street art! Oh yeah, where was I…? Food. Two words for you: APPLE PIE. 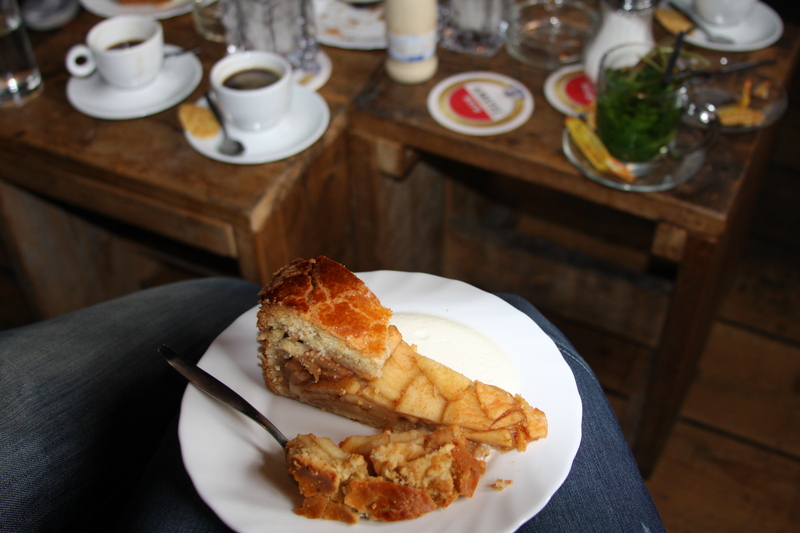 But not like apple pie you’ve ever had before – this is Dutch Appeltaart. I am totally not a sweet person, but this appeltart was something else! Then, the icing on the cake. 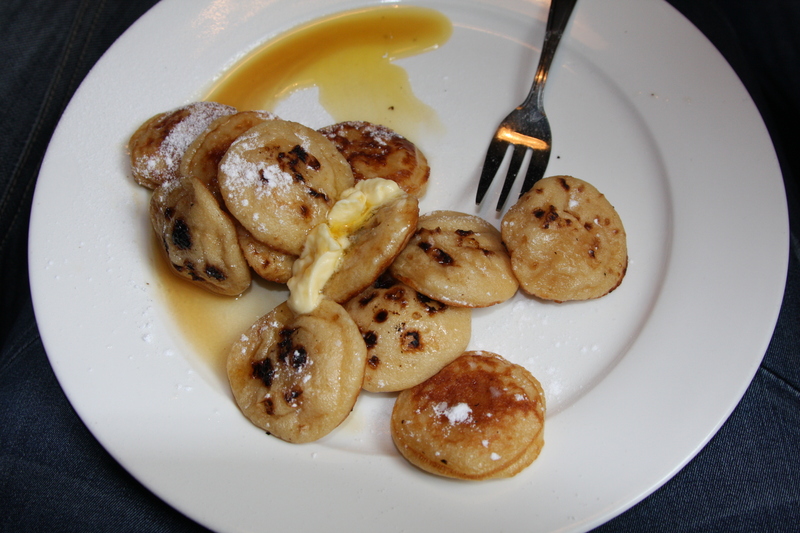 My first ever taste of poffertjes! I can confirm they are as good as they look – if not better! So, there you have it. 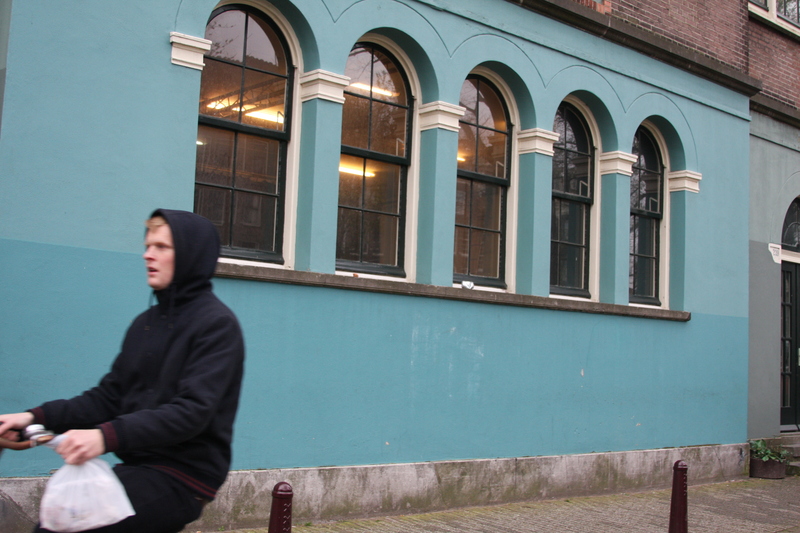 Edited highlights of the Eating Amsterdam Food Tour. 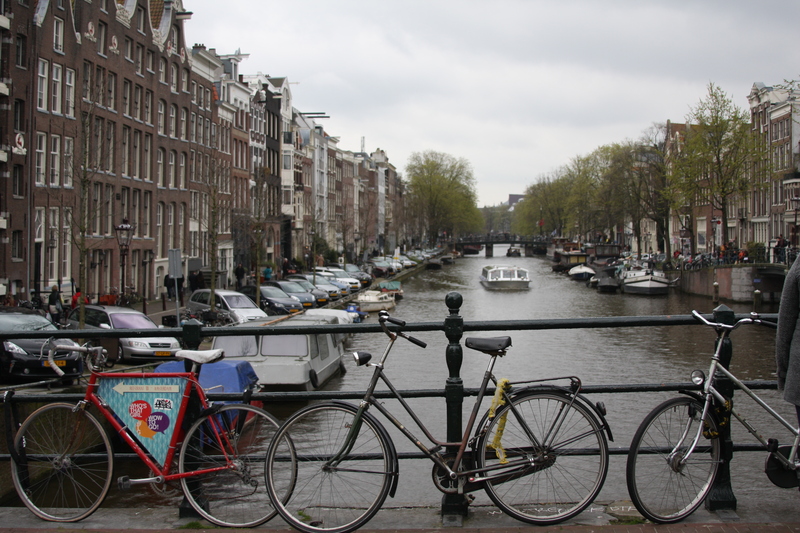 It is definitely one of the best things I’ve ever done in Amsterdam! 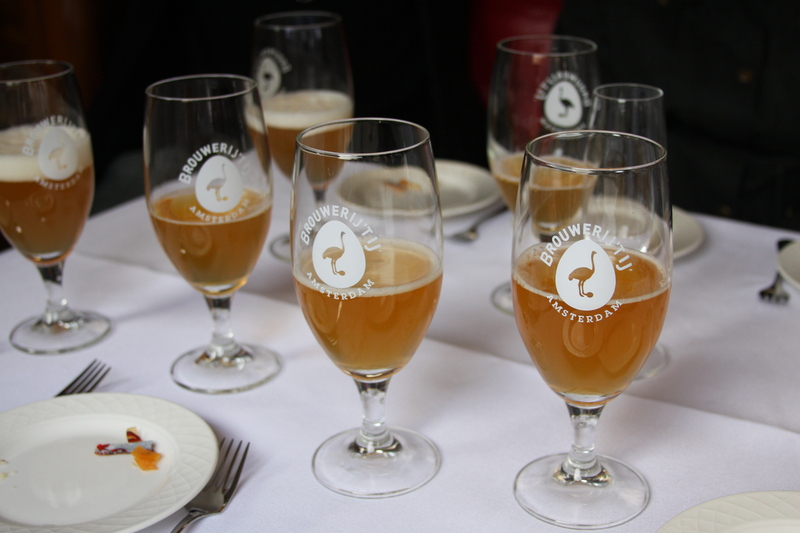 The full tour is 4 hours long with 7 stops and 12 tastings. It starts at 11am and finishes at 3pm, so take my advice and skip breakfast! Or if you can’t… have a VERY light breakfast. You and your bellies will thank me later! 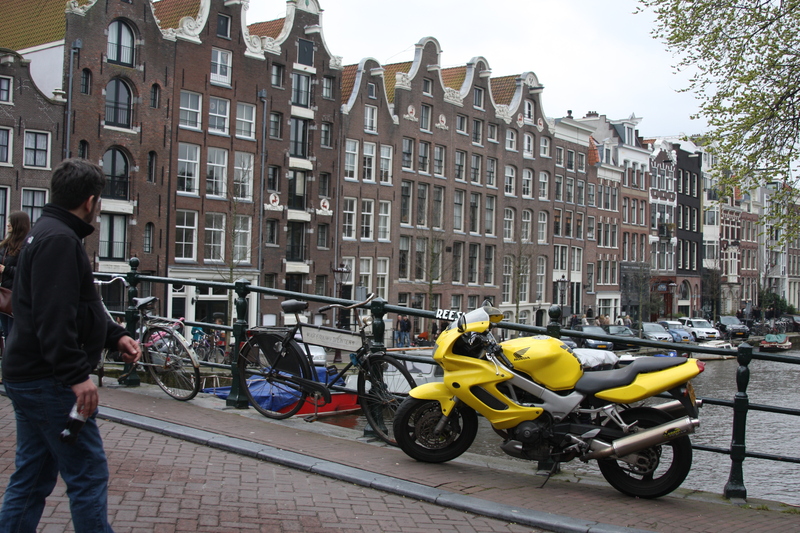 Note: I was hosted on the tour by Eating Amsterdam but all views and opinions – as always – remain my own. 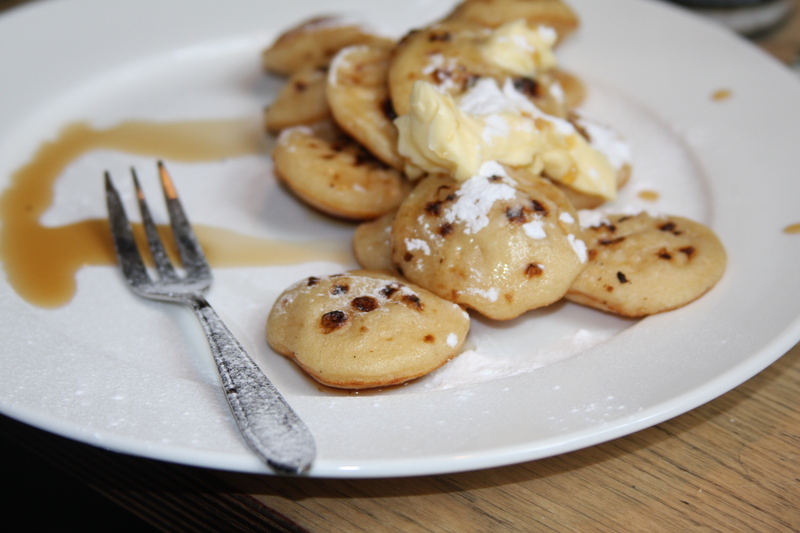 I can’t believe your first taste of poffertjes and you have been there over a year? I know, me either. I really don’t have a sweet tooth, so that must be the reason! 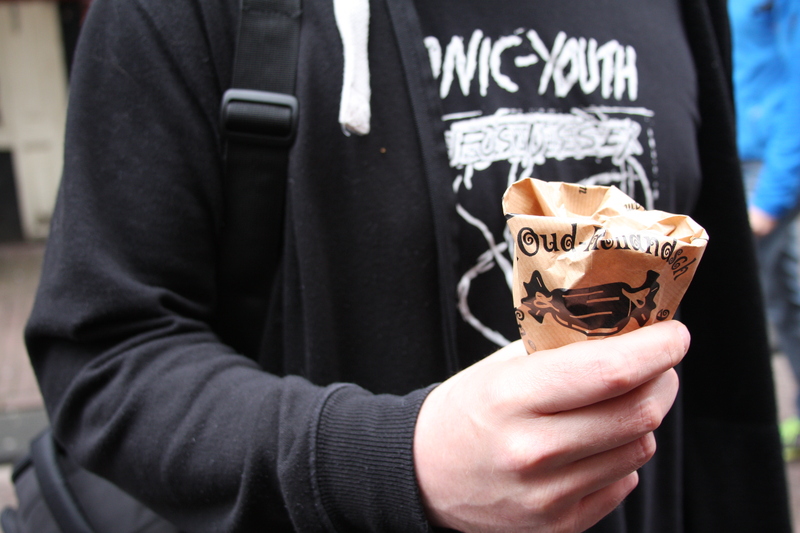 Glad to have ticked it off the list though… they were delicious! 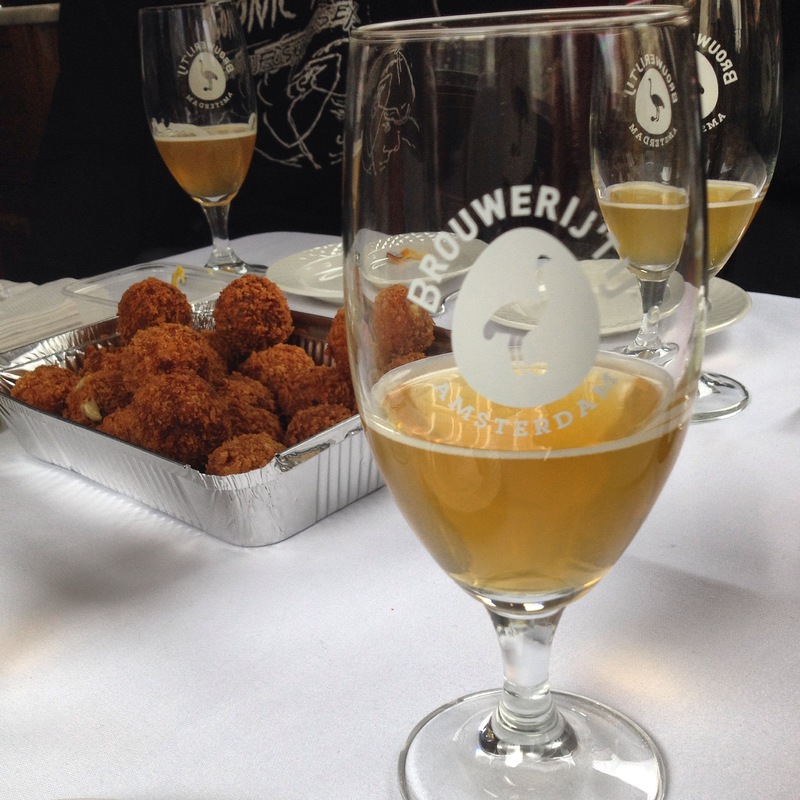 A shameless plug for my little city: I think one of my favorite bars in Enkhuizen sells the best bitter balls I’ve ever tasted. 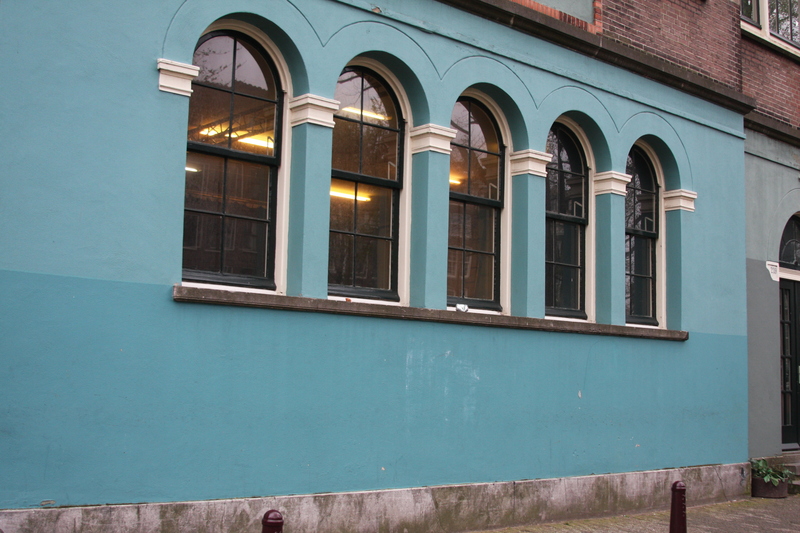 They are nicely presented individually and are called ‘Maximaaltje’. Our king in his younger days visited this bar with some frequency, and a couple of years ago visited again when he became king. The owner of the bar ‘saved’ them from the whole seller, as he was about to skip them from his inventory. 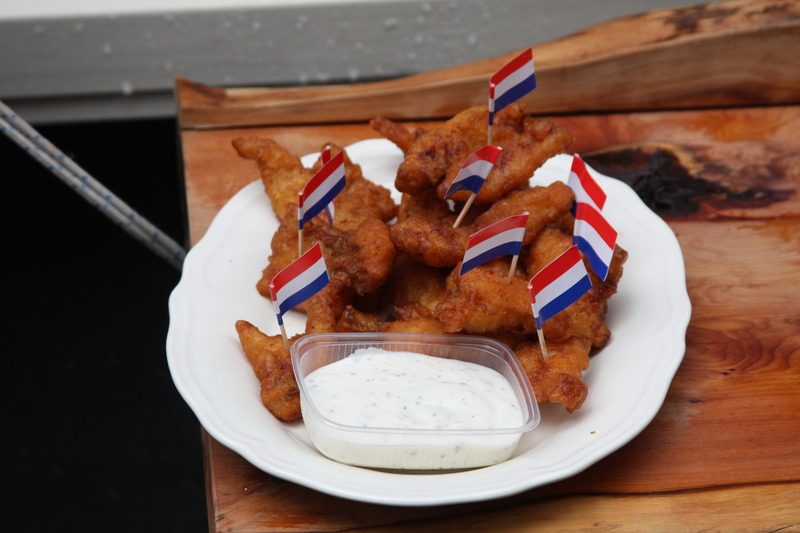 They are from a wholeseller called ‘De Kweker’ (not Kwekkeboom) and are bigger than usual by about half an inch in diameter and are the nicest and meatiest I’ve ever had. 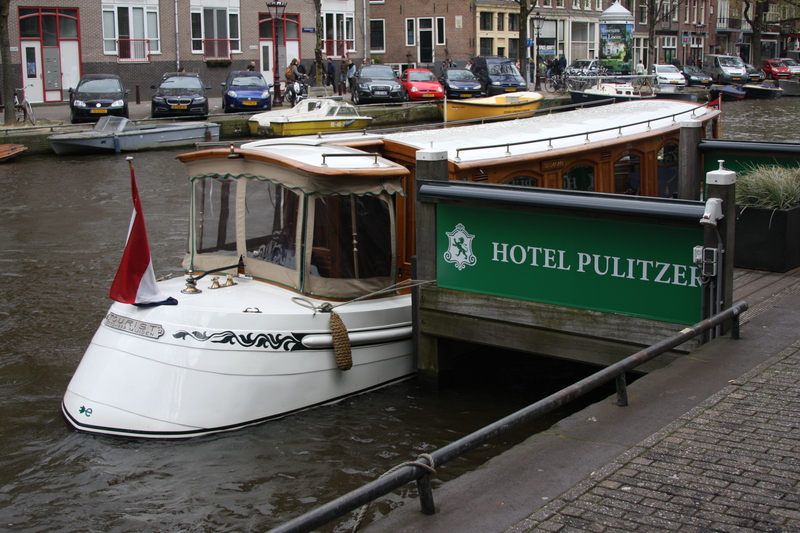 You could combine this lovely balls with a visit to are world famous ‘Zuiderzee museum’ or just wander around in our pretty little city! I have no ties with this bar but felt the need to bring this fabulous bitter balls to your attention! Many thanks for the tip, I love getting insider information like this – much appreciated!! That appeltaart looks very lekker! 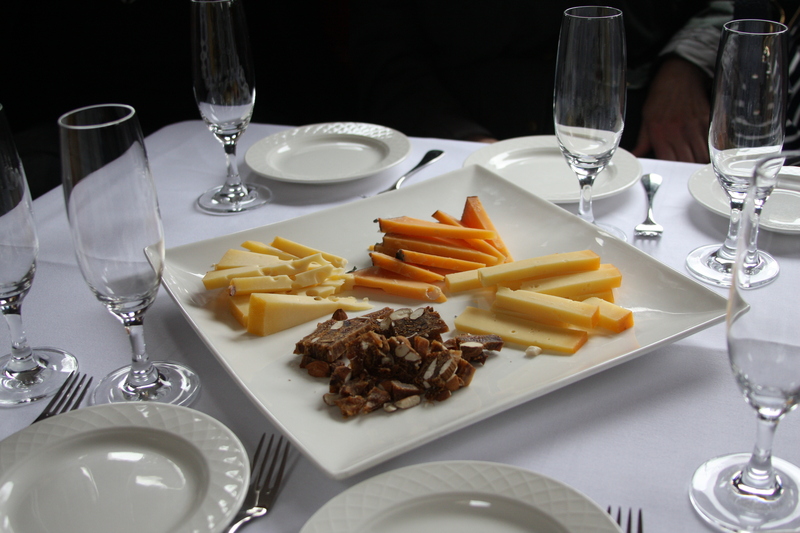 Thanks for sharing, I love food tours! 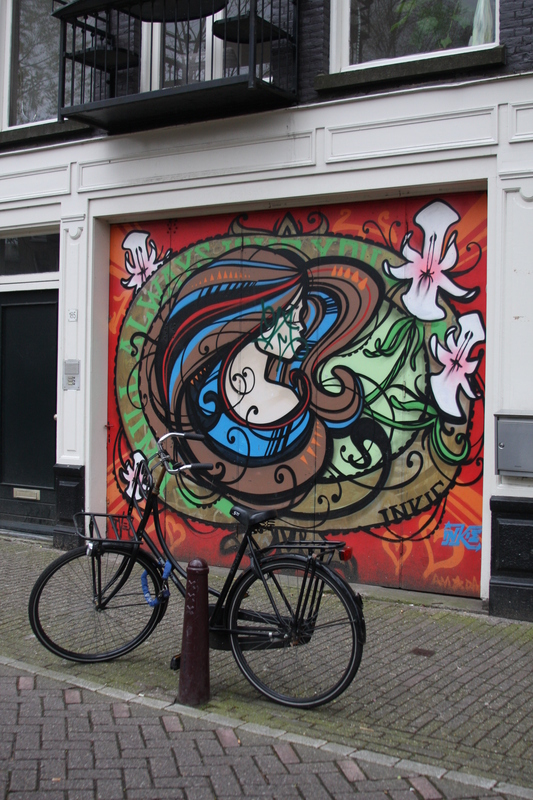 Those street art photos are wonderful. 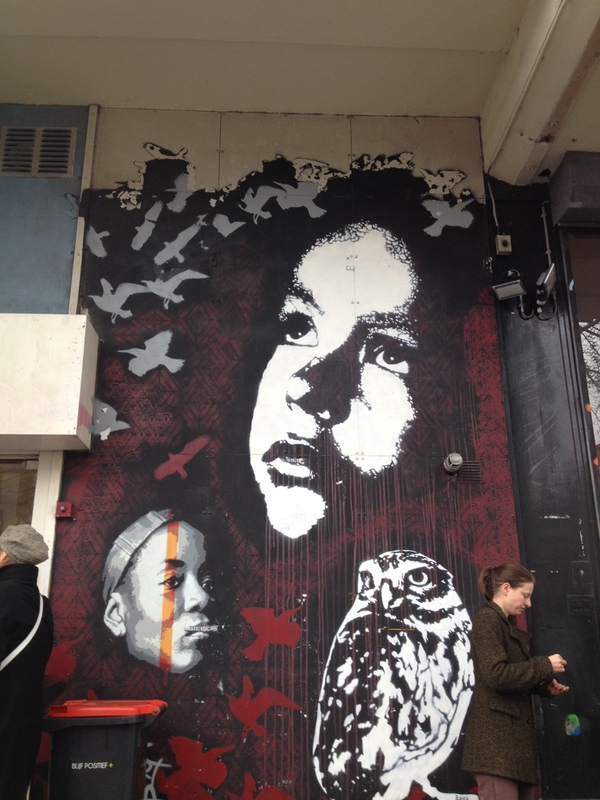 I especially love the red one of the huge faces, the owl and the birds. 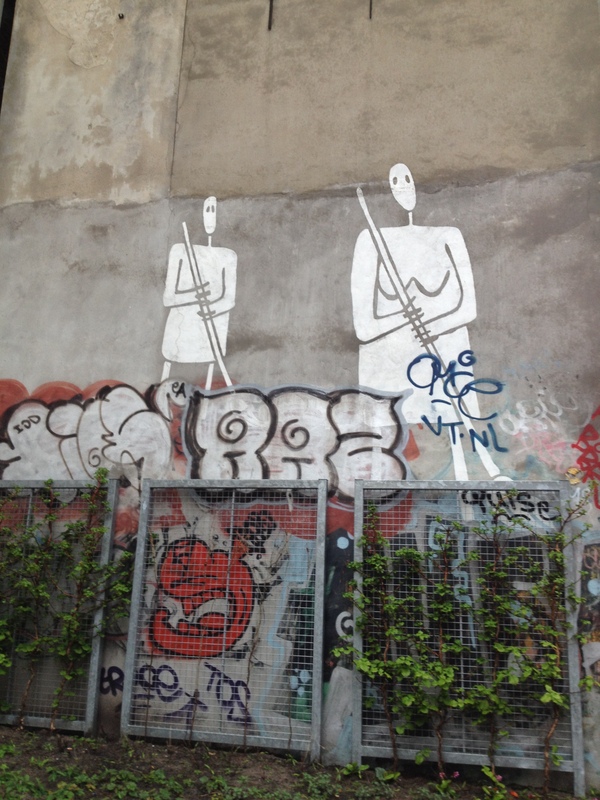 I like to take photos of street art, too. Actually, I rather like the people in the photos of the wall. 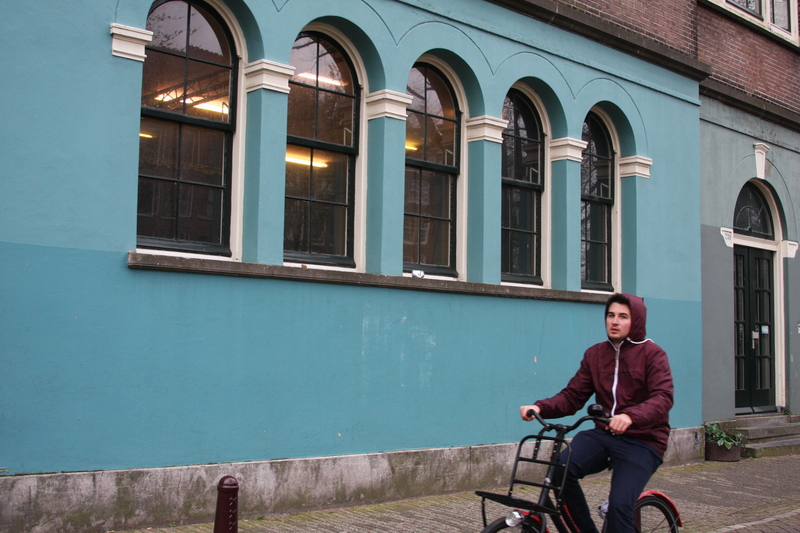 Dutch fashion at its best – hoodies, anoraks and bikes. 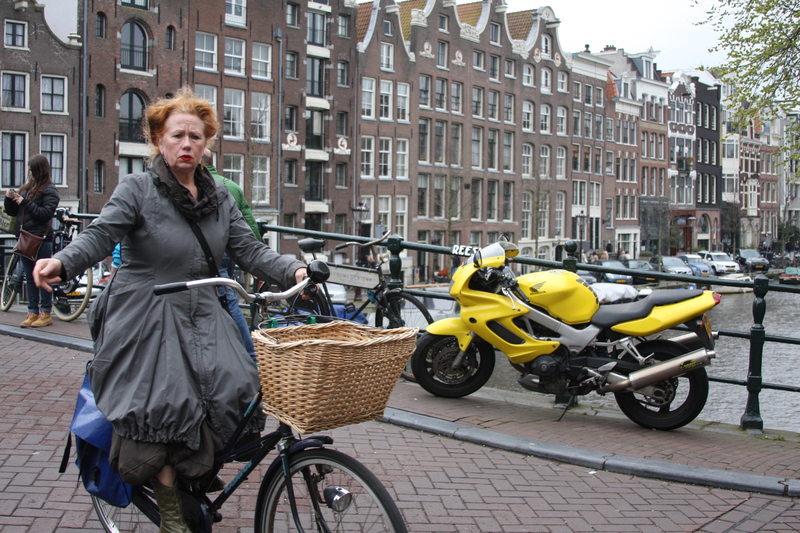 Plus the über-Dutch lady crossing the bridge – the hair, the dress, the bike. Great people photos!